Artworks from the exhibition Art in a Time of Chaos: Masterworks from Six Dynasties China, 3rd–6th Centuries—such as the ceramic flask and Persian silver plate I discussed in previous posts—show in a concrete way the influence of foreign culture on China during the Six Dynasties period. The most important example of this in the exhibition is a set of monumental marble panels from the tomb of Yu Hong. Each of these panels weighs between 800 and 1600 pounds, and they took a dedicated crew more than a week to install (whew!). Imagine our surprise when we opened the crate for the first panel, only to find that due to a stone prong on the bottom of each panel used in their original assembly, the panels were packed upside down! Believe me when I say that it is no easy feat to rotate an 800-pound stone panel upright without breaking it. The panels are one of the most exciting archeological discoveries in China in recent years, and have been studied extensively. Their significance has been transformative in our understanding of north China at the time, and they reveal a diverse culture of multiple ethnicities that has completely changed our understanding of history. Yet, for each question they answer, a dozen more questions emerge. As I examined the panels when they were being installed, I found myself noticing in particular the connections between their decoration and Buddhist painting. Yu Hong himself almost certainly was not Buddhist, and given the prominently Persian character of his funerary furnishings, he was likely to have been Zoroastrian (this is, of course, during the pre-Islamic period of Persian history). However, the royal banquet scene in the main central panel, an exceptionally early example of the subject in Persian-style art, is surprisingly similar to the scenes of Buddhist paradises that were emerging around this time, and became one of the dominant themes in Buddhist art during the following Tang dynasty. The scene shows a Persian royal couple seated in the middle under a tent-like structure that extends outward diagonally to each side, flanked by attendants with offerings of food and drink. In the lower register, an orchestra of musicians is placed to either side, with a whirling dancer in the middle providing entertainment for the couple. Replace the royal couple with a Buddhist triad, the tent with Chinese wood-frame architecture, and you have all the essential elements of a Buddhist paradise scene, the influence of which extended internationally during the Tang period to Japan, as evidenced in the museum’s own superb Taima Mandala from centuries later. While the upper carved panels are doubtless one of the most dramatic moments in the exhibition, the lower base is all the more remarkable. It is adorned with not carved, but rather painted scenes, in brilliant mineral pigments as vibrant now as they were when first drawn one thousand five hundred years ago. The painted scenes reveal an upper register of paired figures seen through the windows of a balcony, which is also a common motif in early Buddhist cave chapel painting from across the Silk Road, found for example in the murals at the Kizil Caves in Xinjiang and the early caves at Dunhuang. Most surprising of all, though, is that one of the figures on the base of the Yu Hong panels is in the classical “pensive Bodhisattva” pose, with one leg crossed over the other knee, and a finger raised to his cheek as he ponders in deep thought (centuries before Rodin!). If you look closely enough, you will even notice that the figure even has a Buddhist halo. 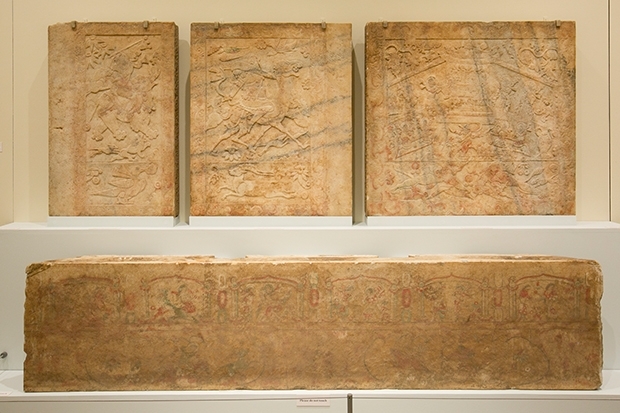 Given the uniqueness of these panels, the relationship between ancient Persian and Buddhist art they suggest is likely to remain little more than a lingering hint of something that might have been. However, in some ways perhaps it is better that way, providing us with the chance to exercise our imaginations as we cross vast distances of time and space to ponder, as the painted figure in the “pensive Bodhisattva” pose ponders, the movements of people, culture and ideas across the immensity of the Eurasian continent in the remote past.